Having a hard time writing your college admissions essay or personal statement? Get A+ help on your college essays and supplements! You might have asked yourself these questions: What do I write about? How do I find my own voice? What the heck does this prompt want from me?! Should that exclamation point be there? We cannot write the essay for you but would love to help you understand how to present your best self during the typical, crazy application season. Essay Review: For applicants who have finished their essay or who have a completed rough draft, A+ provides "an extra pair of eyes" and will review content and check for flow, organization and clarity of thought. Essay Editing: A+ can provide essay review as well as editing of grammar, punctuation, spelling, word usage. The Brainstormer: No ideas yet? No problem! Our most popular service can be provided by a telephone or Skype/Google Hangouts session to jump-start the essay writing process. 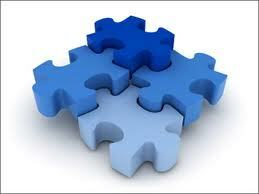 College applications are like a puzzle...call A+ for some help.